The New Zealand Festival and Wellington Community Trust (WCT) have signed an agreement recognising the close and co-operative working relationship which has been developed over a number of years. The WCT Board of Trustees has approved funding of $200,000 for the current financial year and confirmed the Trust’s commitment to provide financial support to the Festival for the next two years. Chief Executive of the Wellington Community Trust, Mark Cassidy commented, ‘Over the last 30 years, the Festival has established an outstanding track record for presenting diverse and inspiring performances to people throughout the Wellington region. The Trust first funded the Festival in 1998 and since that time we have built a special relationship which is recognised in this new agreement. 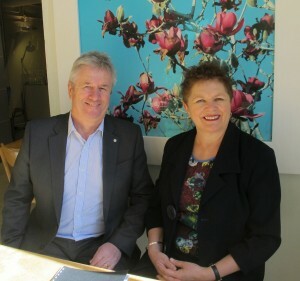 Sue Paterson, Executive Director of the NZ Festival and Mark Cassidy, Chief Executive of the Wellington Community Trust met to sign the agreement on behalf of their organisations. Under this new agreement the Trust and the Festival will work more closely together. This includes the Wellington Community Trust being a partner in one of the major events of the Festival – SchoolFest, a special part of the Festival it has supported in the past. The programme will be launched in early November. The New Zealand Festival 2016 runs from 26 February to 20 March. The full programme was announced on 21 October and bookings are open.